ysabetwordsmith | Poem: "Differently Abled Heroes"
This poem came out of the June 6, 2017 Poetry Fishbowl. It was inspired by prompts from dialecticdreamer and readera. It also fills the "handicapped heroes" square in my 3-1-17 card for the Disability Bingo fest. This poem has been sponsored by janetmiles and Shirley Barrette. It belongs to the shared world project Schrodinger's Heroes. Warning: This poem deals with disability. Some characters have a healthier view of it than others, and not everyone agrees on what language is acceptable. Please consider your tastes and headspace before reading onward. or alter!Kay has a raging case of PTSD. It's harder when it's Alex. just that they know the odds. with a hole ripped in one knee. for them getting home in a hurry. They know the drill, though. introduce Alex to who she really is. "I'm not good for much." starting to hate this place. and she does it, somehow. knows how to get them home. "I don't want to do this,"
and I don't want to be alone again." Someone will have to tell her. to survive a lot longer." to fare much better," Quinn adds. "We can take you with us," Pat offers. you could go and follow your dreams. What do you say to that, Alex?" "I, I need to think about it,"
she says, biting her lip. if someone doesn't remind them. for her to do things by herself,"
not that it's any of your business,"
or find somebody who will." I come in here," Alex mutters. the food is really good and really cheap,"
a bus ride, and that's ... inconvenient." rarely have any accommodations at all. when the food comes it's fantastic. just how things are, though." "This world doesn't deserve you." "I thought about your offer,"
the last bite of her salmon. her empty paper in the trash. People may love or hate the phrase "differently abled." It relates to social and medical models of disability. I typically use it to describe things like autism that create an uncommon pattern of strengths and weaknesses. In this case, however, it refers to multiple versions of a person across the dimensions having different ability levels. This touches on the Alternate Self Trope, and as Chris mentions, also the Dead Alternate Counterpart. If you mistreat people, they may leave -- and Rude Ableist Lady will probably never realize that she inadvertently doomed her world by snubbing Alex. 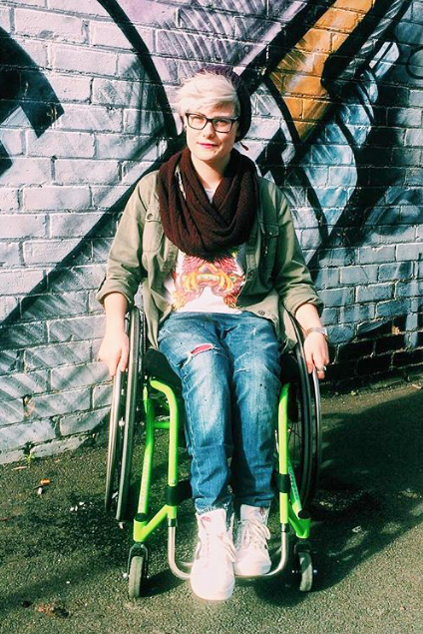 Here is alter!Alex in her wheelchair. Amyotrophic Lateral Sclerosis is a progressive neurodegenerative disease that affects nerve cells in the brain and the spinal cord. It is also known as Lou Gehrig's Disease. Multiple Sclerosis is a disease in which the immune system attacks the central nervous system, and tends to follow one of four common patterns of development. Cerebral Palsy is a non-progressive condition caused by damage to an infant's brain. It does not cause cognitive impairment, and many people with CP have average or higher intelligence -- but sometimes the same root cause behind the CP also instigates other problems that may impair the mind. Backstopping means giving someone a chance to respond first, and if they don't, handling it yourself. In this case, the person being mistreated has the first right of response, but after that, bystanders may object on grounds of preferring civility to discrimination. People with disabilities are more likely to suffer abuse or neglect. Learn how to deal with that and with everyday bigotry. Many people with disabilities have difficulty traveling. In our dimension, bus systems typically have most or all of their stops and vehicles accessible now. However, some still have little or no accessibility, which causes serious problems. Explaining things to people, such as racism or disability, can be exhausting. You aren't actually obligated to do it. Pat understands this from the racism angle, but alter!Alex doesn't have much awareness of identity theory yet. But, I caught myself, thought a moment, then asked the woman in the wheelchair how best to hump the darn thing up into the train, because who the hell else would know best how it works? I think that's the difference, taking one moment to think about what you're doing. 2 days after trans-esophageal echo and its sedation, all this autistic person has access to is aphorisms really. Here goes! 2) It's OK if the life you save is your own. 3) May you get, not what you want, but what you really deserve. Otherwise, I actually try NOT to remember specific diagnosis for other people, because of all the stereotypes surrounding each one. I'm more likely to ask someone I'm spending time with, what do they specifically want me to know and watch for close to my own symptoms, and I volunteer my own list of vertigo, balance or tremors, aura, blood sugar drop, lips or fingernails going blue, and changes in language usage. Want an icon for those times? I made this one, and I give it freely. Amyotrophic Lateral Sclerosis is probably better known as Lou Gehrig's Disease. Or maybe that was just my generation and the one before. I was at a trial once where the plaintiffs were all deaf, and there was a team of interpreters to translate between spoken English and American Sign LanguageWP (ASL). The judge kept saying "ALS". When the trial broke for lunch, I spoke quickly to one of the guards, then with permission hurried forward to speak with the judge as he headed for his chamber. "Excuse me, Your Honor. American Sign Language is ASL, not ALS." He smiled and nodded, and iirc he got it right for the rest of the trial. I've heard the name but hadn't connected the two. I have added a note. Wow, that's amazing. It's hard for people with disabilities to get justice -- even getting into a courtroom is hard because people don't take them seriously. I'm impressed. Few people in power are willing to learn from their mistakes, and those who do are to be treasured. To be clear, I was at this trial as an expert witness on ASL and speech recognition technology: an unusual combination, which is how it came to me. It was a group action against a housing developer for failure to provide reasonable accommodation. I think the judge was just slipping from an unfamiliar abbreviation to a familiar one, and once it was brought to his attention he made sure to get it right. My impression of him was as a reasonable and considerate person concerned with the protection of rights on both sides. Looks like a DW --> LJ transfer error. I have tried to fix it.